My kids know that when it’s their birthday, they can chose whichever cake their heart desires and I will stay up all night making it for them. I try to plan in advance, but inspiration tends to hit at the last minute. 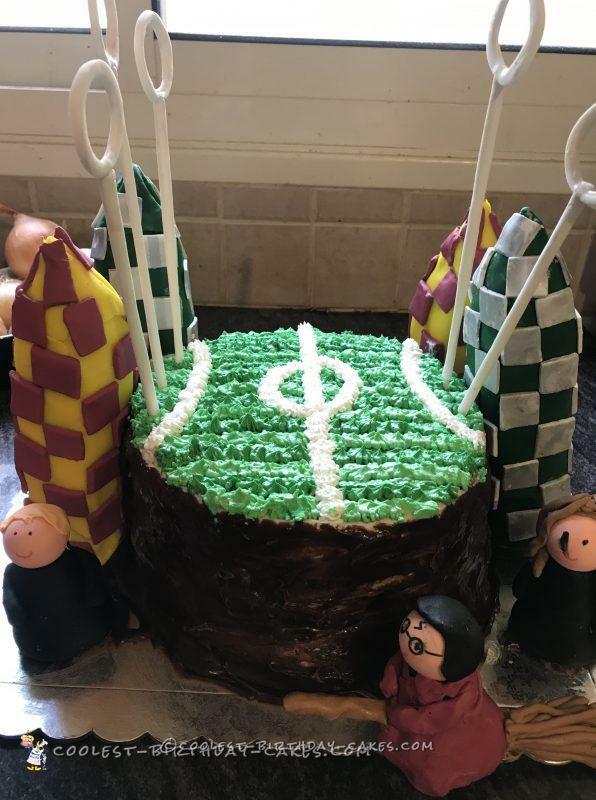 So, when my 9 year old requested a Quidditch cake for her Harry Potter themed birthday party, I was ready. In addition, my darling children like to put in specific requests to further challenge my skills. For this cake, my instructions were to use mainly buttercream frosting and she wanted a lot of figures from the books. Like, Harry, Hermione and Ron, of course. But also tons of people cheering on the Quidditch match. Right. 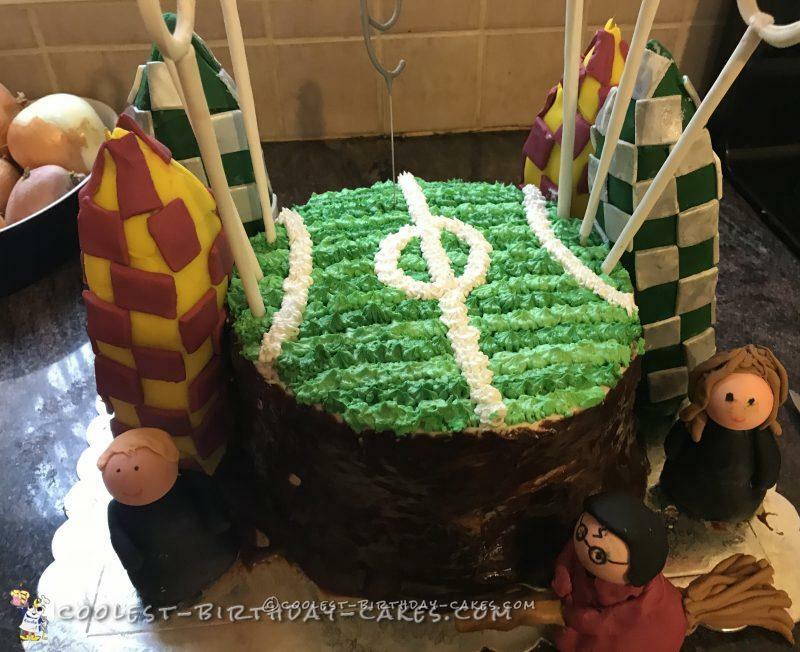 One more thing, the cake inside should be in Gryffindor colors. 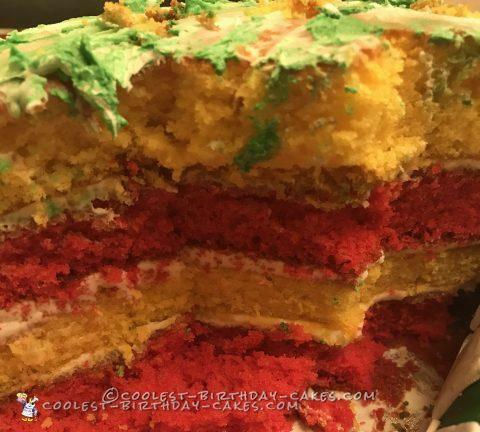 I baked four layers of cakes. Two yellow and two burgundy. The burgundy layers turned out a much brighter red that I anticipated. I actually went out and got a different shade in order to make the burgundy fondant. For the Quidditch pitch, I studied pictures from the movies and saw that there were alternating lines of light and dark green. So, of course, I had to stay true to that vision. An hour later, I was wondering why I thought that was so important. Well, you live and learn. I used gumpaste around a skewer and then added rings glue on with gum glue. I made extra which was good because I had some breakage. Making figures is something I always want to improve. I will definitely take a class at some point. For this cake, I decided that sleep was more important than perfection. I went as simple as I could. 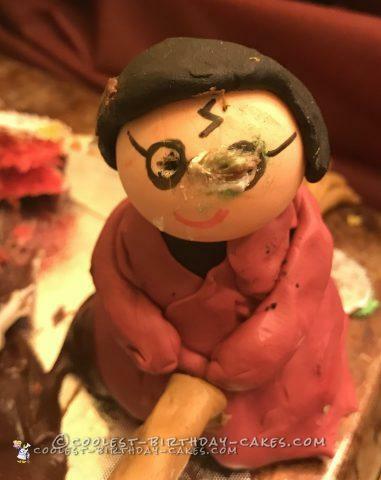 My favorite was Harry after the cake had been cut (below) because there was frosting all over his face and he looked like he went through a real Quidditch match. These were by far my most time consuming task. I made Rice Krispie Treats in advance and then smushed and carved them into four towers. I covered Slytherin’s towers in green and Gryfiindor’s towers in yellow. Then I spent a hundred hours (slight exaggeration) listening to TED talks while I cut out a million squares (not an exaggeration) to place on the towers. I didn’t have the right size square cutter so it slowed the process down a bit. However, I was very pleased with the way the burgundy color turned out. It was the Magic Colours brand. I loved the shade and used it for Harry’s robe as well. In the end, my daughter was so happy when she saw the cake. She was extremely thankful and felt so special. 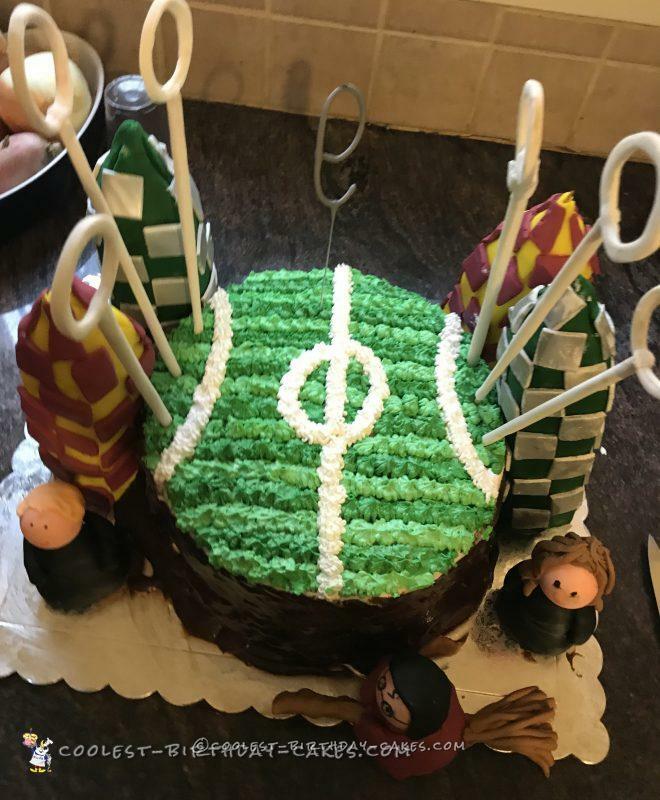 She did say that she expected Harry to be flying over the cake but that’s what happens when you think your mom can do anything with a cake. Maybe next year.